Can Brick and Mortar Retailers Fight Back? Amazon.com has been installing these lockers in downtown locations for some months now. If you live in an urban area and your mail slot won't take a package, you can have your purchase sent to a locker and pick it up there with a special code that Amazon.com can text to you. It's a clever idea, and competes with Best Buy's in store pickup for online purchases. 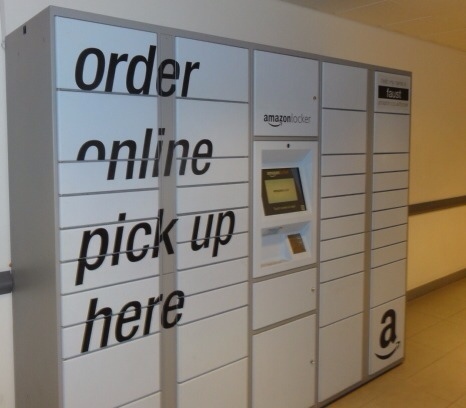 In fact, some people really prefer the Amazon.com locker because they don't need to wait in line, and depending on the locker location, they may pickup their package at any hour. So Amazon.com has found a solution to the home delivery dilemma for people who can't have the postman leave a package at their doorstep. As the retail landscape continues to evolve, one wonders how the brick and mortar stores will ever survive. Marketing and Branding guru David Aaker has posted an interesting blog describing the new retail environment titled: The Retail Revolution is Here. Aaker points out that even though the effects of the “retail revolution” are dramatic, the number of retailers on average, has not declined. Personally, I see lots of evidence that saavy brick-and-mortar retailers can survive. Many have chosen to fight fire with fire by developing their own online operations. Some have found ways to focus on their abilities to provide a personal experience that cannot be obtained on line. Certainly you cannot receive a manicure, or get a hot cup of coffee on the internet. More than this, however, focusing on the satisfaction of seeing, touching, and buying in person can help even a neighborhood bookstore succeed. We have a great example here in the Phoenix area with Changing Hands Bookstore which is now preparing to open a second location. So what are your thoughts? Will Amazon.com's cost advantages and strengths allow it to take over retailing as we know it, or will the retail revolution give consumers more and better purchase options? This entry was posted in Books, Bookstores, Business and tagged Amazon, Amazon.com, bookstore, online, retail, retailing. Bookmark the permalink. ‘Some have found ways to focus on their abilities to provide a personal experience that cannot be obtained on line.’ That’s what I hope will keep bookshops alive; no website can compete with the experience!